the west coast of Africa in present-day Nigeria near the border of Cameroon. "A British consulate for the Bights of Benin and Biafra was established in 1849 on the off-shore Spanish island of Fernando Po. In 1853 the appointment was divided with a consul for the Bight of Benin at Lagos. The consulate for the Bight of Biafra was transferred to Old Calabar in 1852. "A British protectorate was proclaimed over the coastal area, with the exceptions of the colony of Lagos and the centre of the Niger delta, on 5 June 1885. It was not, however, until July 1891 that steps were taken to set up an administration with the consul-general at Old Calabar and vice-consuls at some of the river ports. "The consulate-general at Old Calabar and the vice-consulates at Benin, Bonny, Brass, Forcados, and Opobo acted as collection and distribution centres for mail from November 1891, but were not recognized as post offices until 20 July 1892." The cover received four strikes of the Old Calabar River CDS. the rate of 2½d. was the proper Empire rate so the strike is probably just a mistrike. Routing for the cover was requested via the Royal Mail Ship Matadi. The R.M.S. Matadi was a ship of the African Steam Ship Company, Limited. London via Plymouth to Madeira, Tenerife and the West Coast of Africa. In 1856, the home port became Liverpool. In 1888, service to Calabar was begun. It went on to become Elder, Dempster & Company, Limited with worldwide steamship operations. was lost in 1896 after a cargo fire in Boma with 45 lives lost. Boma was about 80 km inland on the Congo river in present-day Zaire. was given a red Paid British Packet receiver on September 1. BRITISH | PROTECTORATE | OIL RIVERS. 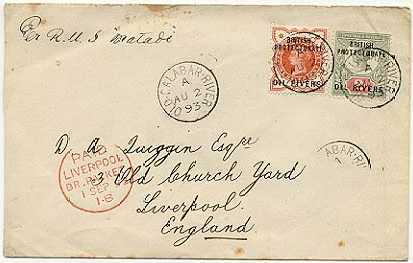 The cover is franked with the 1892 ½d vermillion and the 2d. gray green Victorias (SG 1 and 3).